Whether you’re looking to spruce up your kitchen or bathroom or are looking to stock your cabinet shop’s inventory with the best cabinets and moulding products around, MTE Millwork is your solution. As the business arm of the Menominee Tribe, we use traditional philosophies of land management. This ensures our Menominee Forest is able to produce a steady stream of quality wood products, while maintaining the health of the environment. MTE Millwork products are milled right on site, so we have minimal carbon footprint. The trees used for your wood trim and cabinetry were sustainably sourced. We use the indigenous knowledge of the Menominee Tribe to ensure proper forest management. Your cabinetry can be customized to your exact specifications so its style and function will completely satisfy your needs. Our quality wood moulding and trim comes in a huge variety of profiles, and is crafted with the same care as our cabinetry. Contact our skilled cabinet makers to get a quote on MTE’s cabinetry and moulding products. MTE Millwork’s cabinetry, trim, and moulding products are sustainably built from wood/lumber sourced directly from the Menominee Forest. 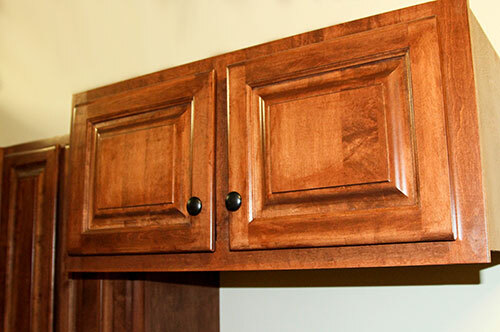 When Wisconsin cabinet dealers order MTE’s cabinetry to sell in their stores, they are offering their customers a high quality and durable product. They’re able to assure customers that the cabinets installed in their homes were manufactured sustainably following indigenous and responsible methods. Being able to work with a large mill that is in your back yard! You have a local source which meet LEED’S 500 mile radius for large projects. Everything we do is sustainable. Most state and federal projects are asking for it, so why not have a line the meets the requirements? Our cabinet Line is unique. If someone is looking for the absolute best wood cabinet maker, then we are it. We use wood harvested from our forest, which we have been doing more than 150 years. Our plywood has no urea formaldehyde at all. The glue is soy based, no petroleum products. Ultra low VOC on our prefinishing, all water base. Always soft close drawer hardware and hinges. An all plywood box, reinforced, for easy installation. Six colors, natural, and white. Delivered to the job site without boxes, wrapped with blankets. Our wood moulding line is available in standard profiles, but custom is available. Solid wood and great profiles. Available in many species of wood grown right here at our reservation. Long lengths available in most species. We can also do a wide variety of custom products on request such as cutting boards, grilling planks, glued up tops. 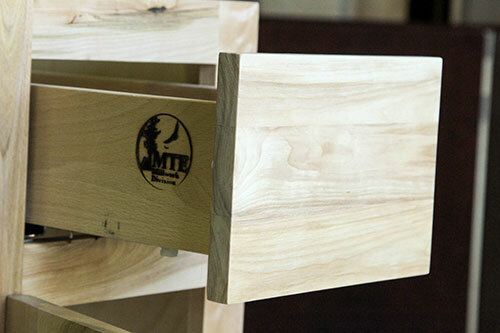 Interested in becoming a dealer of MTE Millwork's products? Contact the sustainable cabinetry makers today!